Today , I am gonna share an awesome trick in which you can download and use any Paid app from Google Play Store . In this method you don't need to have a rooted device so don't worry if you have an unrooted devices . You guyz probably thinking I'm gonna hack or crack something ? Nope , Its not illegal at all , The below process isn't about hacking or cracking so don't worry about it . 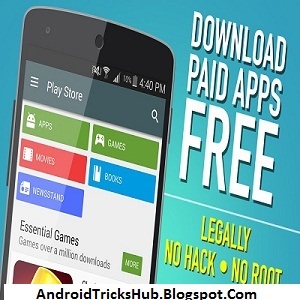 You can use this trick to download any Paid app , whatever its game or app absolutely free. 1. Open Google play Store and search for any paid application you want to download for free and than minimise that tab. 2. Open any Internet browser in your phone and type getapk.co in the url and hit enter. 3. Now it will ask you to allow and download the application, Click Ok.
4. After download install that app in your phone. 5. Now come back to google play store tab in which you search the paid application. 6. Scroll down and you will see a share option click on it. 7. Share it with Getapk application. 8. Now it will automatically search that paid application which you share from google play store in Getapk. 9. After processing you will see that paid application is shown in the screen click on Get button. 12. After click you were redirect to the linkbucks ad page wait for 5 seconds and click on skip ad. 13. Now you will see zippyshare website is opened and you will see an Download button.Click on it. 14. Done your download is being started and you will get that paid application for free. 1.Almost 90% apps and games you will get there. 2.Sometimes one download link is not working than try for another link. 3.I prefer to download the application with ucbrowser. LIKE , COMMENT , SUBSCRIBE TO MY CHANNEL FOR MORE AMAZING TRICKS AND TIPS . Thanks a lot for sharing this guide on How to Download Paid Apps for Free. It really helped me a lot.